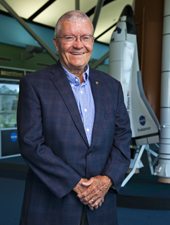 On April 12, 2012, at the age of 78, astronaut Fred Haise opened the doors to the Infinity Science Center, welcoming visitors to the spectacular new state-of-the-art educational facility at Stennis Space Center. Initiated with a bold idea more than 10 years earlier, Infinity became a reality through the creativity and determination of Haise and his fellow visionaries who never considered the possibility of giving up on their ambitious goal. Today, the Infinity Science Center thrills, challenges and inspires visitors to think big, see new possibilities, and reject limitations on what they can imagine or accomplish. Few people can speak with more credibility about exploring new worlds and realizing their full potential than Fred. World renowned as a member of the Apollo 13 space mission, Fred’s capacity for problem solving was put to the test when his very survival depended on finding a way back to earth after his spacecraft was severely damaged on its journey to the moon. As one might imagine, that experience in 1970 underscored some valuable life lessons for Fred, such as the value of staying calm in a crisis. Through the years, however, the importance of taking initiative became an increasingly dominant characteristic in Fred’s life. While life experience certainly demonstrates the value of collaboration, we also learn that successful outcomes begin with the vision and determination of a single person. Life experience has shown Fred that sitting back and waiting for others to make things happen is a certain route to failure. And so, as he actively supports and encourages more interactive education to nurture scientific skills and discovery, he also takes the initiative to improve the situation on his own. Through personal appearances, speeches, fundraising drives and tireless determination, Fred is a testament to what can happen when someone cares enough to make it happen. Fred Haise … Peoples Health Champion.